As his name implies, Cuban-American rapper Armando "Pitbull" Perez likes to sink his teeth into a challenging project and not let go. He's determined to take his career to the next level with the release of his upcoming sophomore album "El Mariel," out Oct. 31, 2006. The album takes its name from the 1980 Mariel boatlift which brought 125,000 Cuban refugees to the coast of Florida on barely-seaworthy craft. Pitbull admires the "Marielitos" who beat the odds to make a new life for themselves in the United States. He sees a parallel in his own struggle for success in the rap game. "This (album) is my boat lift," says Pitbull. "They let me in the game when I had all the strikes against me; you know, white, blue eyes, from the South, Cuban. Now that I have my foot in the door, I'm trying to take full advantage of it. I'm taking all the negatives in my life, and turning them into a positive." The rapper says the album is dedicated to his father, also named Armando. During his childhood, Pitbull had little contact with his father. While his mother struggled to make ends meet, Pitbull was shuttled from one home to another, even spending time with a foster family in Georgia. His father (and namesake) was a drug dealer who indulged a bit to much in his product. But, when Pitbull was a teenager, he and his father reunited. "It was more like a friendship than it was a father and son (relationship)," says Pitbull. The friendship was cut short when Armando Sr. died of liver illness in May 2006. He was 57 years old. Although Pitbull calls himself a hustler, he's not interested in the trappings normally associated with the term. Instead of dripping in bling, Pitbull adorns himself with tattoos about what's most important to him. "These right here are my tattoos," Pitbull says, holding up his arms for The ShowBuzz cameras to display music notation tattooed around each wrist. "This is my life, my hustle. It's all about music, because music is basically what's ... been my avenue out of maybe being involved in things I shouldn't be." His other tattoos are dedicated to his mother, and his two children. 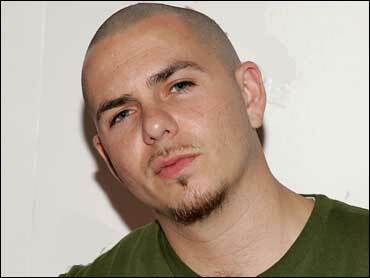 Pitbull is proud of the fact that his music appeals to diverse audiences. "One night I'll be in Los Angeles and it'll be a Latin crowd, and then another night I'll go to Fresno and it'll be an all-black crowd," he says. "To me, that's the beauty of the music." The songs on "El Mariel" are mostly in English, but they never lose the Afro-Caribbean rhythmic influences that define Pitbull's sound. The rapper is also planning to release an album in Spanish later this year, titled "Armando" in honor of his father. Pitbull sees the release of albums in different language as defining what he calls his "movement." "With (these albums), people are really going to realize the significance of my movement and how I bring people together, as far as different languages," he says. True to form, Pitbull is determined not to let go of his dream.